Running on grass feels different than running on pavement. Grass is softer and offers less impact as the energy of your footfall goes into the ground and provides less rebound. Your legs work harder on grass and will become stronger. 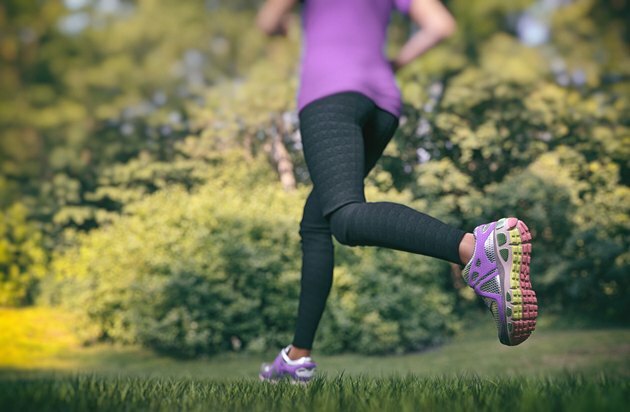 On the downside, your times on grass will be slower and your feet may be more likely to over pronate, so you need to be careful if you are prone to plantar fascilitis. The right shoes will help. Grass is more uneven than paved tracks, and your foot is more likely to twist. You need running shoes with good arch support to protect the plantar fascia, the ligament supporting the arch of your foot, and cushioning that will help protect your heels. In general, shoes designated as trail shoes will have less cushioning than road shoes. Grass can be slippery when it is wet or when there is dew, so grass running shoes need to have more traction than road shoes. Trail running shoes have thicker and nubbier soles than typical road shoes with a deeper tread to provide more traction, to cope with surfaces that include sand, mud or packed earth. If you are running on smooth level grass, a full trail shoe is not required; a light trail shoe will meet your needs. Shoes designed for rough trails often have a lower profile to help you adapt quickly to changing terrain and it is up to you which profile suits your running. Uppers can be made of durable material like leather, which is heavier than many other materials, while uppers made of Gore-Tex are water-resistant, which is good for running on wet grass. The material of the shoe affects its weight. There is no point selecting a shoe that meets all your needs if it is not comfortable and well-fitting. If your feet roll inward or outward when you run, use the knowledge of a good salesperson to get a shoe that will correct or control the movement.